Interested in keeping your tuition costs low? Using Scrip is the easiest way to do that. Families who purchase the $3,000 minimum are not charged the $300 Scrip Commitment Fee PLUS they receive 50% of their Scrip profits in the form of a rebate that can be applied to unpaid tuition, student lunches, or donated to the Parents' Group fund. Think $3,000 a year is a lot? If a family buys $100/week for gas + $100/week for groceries, they will have purchased over $10,000 in Scrip by the end of the year - way beyond the $3,000 minimum. The more Scrip you buy, the higher your rebate can climb and the more you can save. Interested in starting an online Scrip account? Email our Scrip volunteer, Shayna Boe, at shscrip@mediacombb.net and she'll get you started. Sacred Heart Parents Group (SHPG) has participated in a Scrip program for several years now. Scrip certificates are purchased at a discount from a national center and several area businesses. The certificates are sold to you at face value and can be spent like gift certificates at participating stores. It doesn't cost you anything to participate in the program. If you spend $100 on Scrip certificates, you still have $100 to spend at those participating stores. But, part of your $100 remains at Sacred Heart School to help fund the education of the students. The profit level could be from 2 percent to over 10 percent. This is "free" money for the school. If your children are students at Sacred Heart, you can participate in a tuition rebate program by purchasing Scrip. Your family and friends are welcome to participate in this program. Their participation helps to increase the profits of the program, but best of all, they can designate their purchases to go toward your tuition rebate. You can purchase Scrip at the school office, and after Mass in both Adams and Johnsburg on most weekends. 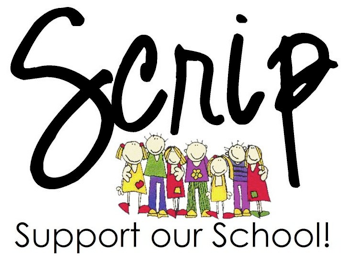 Scrip orders can be sent to school with your children and will be filled and sent home the same day. It is important to know that the Scrip certificates are like cash, so your child needs to be reliable enough to get the order home to you safely. Online Scrip orders made by Monday at 3:00 p.m. will be available in the school office by Friday (these, too, can be sent home with your children). Please see the ShopWithScrip FAQs for more details.